There is nothing worse than having to replace perfectly good dishes and tableware because of unsightly scratches. A complete dinner set can be expensive to purchase and often means that you may have no choice but to use scratched dishes. If you are planning on having any family and friends over for a celebration, we have a simple solution that will make all the difference in clearing up you scratched dishes. There is a simple powder that can be used to easily remove scratches from dishes. The process of removing scratches from dishes starts with the proper materials. Your best bet is to find a product called the Bar Keeper’s Friend. This item is typically available in most grocery stores or it can be found easily online. One thing to keep in mind is that this product is available in both liquid and powder forms. You will need to have the powder form of the product to remove scratches from dishes. When it comes to using any type of powdered cleanser, it’s important to avoid making a mess. You can set up newspapers or use an old table cloth when cleaning dishes that are scratched. Using a sponge or any clean rag is the best choice to effectively remove scratches from dishes. Since the powder is an abrasive, it will essentially be taking off a small amount of the surface coating. With this in mind, more than one application may be needed to help reduce or completely remove any ugly scratches from dishes. 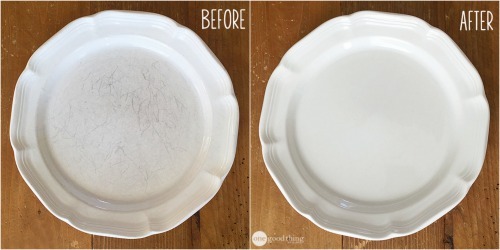 Once you have finished the process, then all your dishes will look much nicer. Just make sure to confirm that every dish has been washed before being used. Ugly scratches that are on your holiday (or regular day) dishes will not stand a chance when the proper steps have been taken.